The IANOS system from HUBER+SUHNER is a state-of-the-art fiber optic management system designed for facilitating fast, flexible, and future-proofed connectivity in the data center. Ideal for Telcos, service providers, or Colos where high performance and manageability is needed, this scalable and adaptable system offers various fiber and connectivity options. 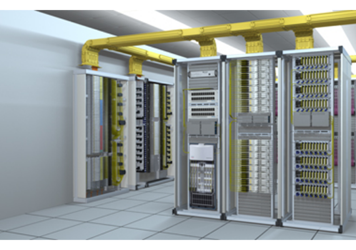 Additional benefits include fast moves, additions, and changes (MACs), low loss, saved space, and readiness for 100G and 400G. HUBER+SUHNER uses the series of Quick-Fit coaxial connectors to meet the requirements of multi-carrier, high-channel-count transceivers in these communication infrastructure networks. These connectors feature high RF performance, simple assembly, high IP ratings, high compatibility, and reusability. For more information on the IANOS hub system, download the datasheet. More information on the Quick-Fit coaxial connectors can be found on page 434 of the RF Coaxial Connectors Catalog. Check out the video below for more on how HUBER+SUHNER is preparing for 5G technologies.